This week we were blessed with a fraternal visit from Fr. Brian Pierce, OP. Father Brian is the General Promoter of the nuns who serves as the liason between the Master of the Order and the nuns. 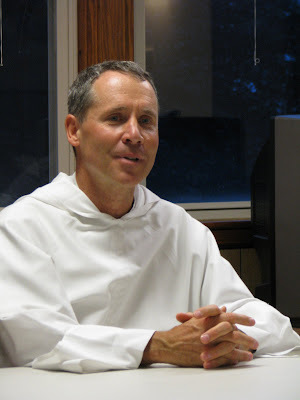 He informs and advices the Master on issues concerning the life of the nuns. Because of his assignment, Father has the opportunity to visit and talk with many monasteries around the world during his terms in office, so he also tries to promote communications and understanding between the different monasteries. Father is a member of the Southern Province. Sr. Joseph Maria was extremely delighted to find out that Father grew up in Arlington, TX (her hometown!). The first Dominicans he met were our sisters from Lufkin. 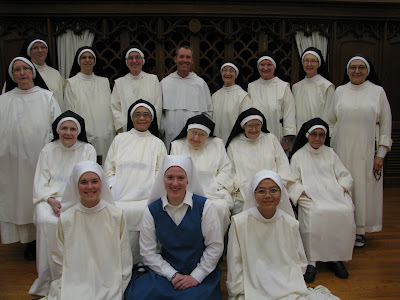 Father's Dominican vocation started because of a suggestion from these nuns. You already know the nuns, Why don't you check out the friars? Father told us his vocation story, and it really shows you the amazing ways God can use to call each one of us to follow Him. Fr. Brian didn't enter the Dominican Order because of any attraction to the life at first but because of a comment made by an older friar at the priory where he was making a come and see visit. At the end of the visit, Father couldn't wait to get out of the place because he didn't find any attraction towards living the life, but as he was walking out to his car, the friar stopped him and asked him how he felt about the visit. After telling this friar that he didn't think God was calling him here, the older friar simply told him that he had nothing to lose in entering and trying it out. This thought struck him while he was driving home because he really DIDN'T have anything to lose, so Father entered and has been in the Order for 28 years! 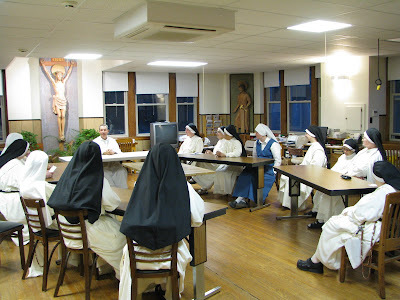 Father meets with the sisters in the community room/refectory. Sr. Judith Miryam interviewed Fr. Brian at our Nuns' Association's First General Assembly in Springfield, IL, last September. Please click on the player below to hear it.